52 years ago today, Ireland lost an incredible feminist voice. Few women have ever managed to juggle being an activist, a rebel, a suffragist, a wife, a prisoner, a judge, a volunteer, a commanding officer, a hunger striker, an author, and the President of a political party, especially during a time when most women were dismissed and ignored. In fact, only one comes to mind. 2004 – Death of Joe Cahill, a prominent Irish republican and former Chief of Staff of the Provisional Irish Republican Army (PIRA). Here’s one that on the face of it, might not normally fit in my blog. I usually rail against the PUP and many loyalist factions and traditions but I always try to give credit where credit is due. David Ervine is one person who deserves that credit and I write that without hesitation, if only to show how similar both sides of the divide in the North of Ireland may be. At the end of the day, I am a firm believer in peace, empathy, and understanding. I also believe that while fundamental change is incredibly difficult, some people can accomplish it. I may be naive, hippy-ish, or simply too far removed from the first-hand experience but I believe David Ervine managed to pull it off. Today would be Nelson Mandela’s 96th birthday. Once a warrior branded a terrorist, he then became the leader of South Africa and a recipient of the Nobel Peace Prize. He died while I was in Belfast, and people were leaving fresh flowers under his mural. 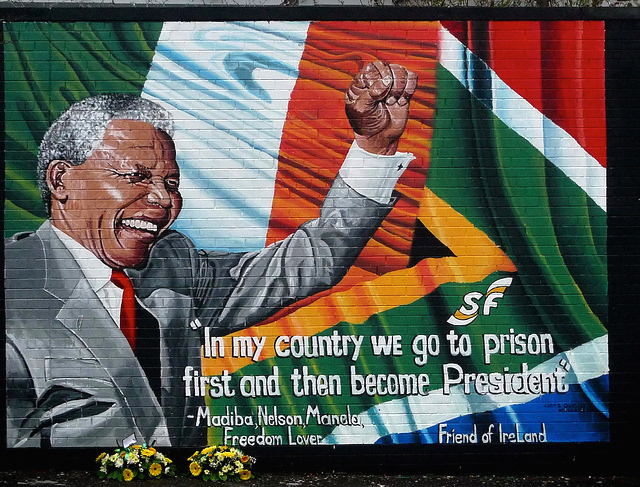 Here’s a lovely picture of the mural, with the flowers underneath to celebrate today which is Nelson Mandela day. On the last day of our recent journey in Ireland, it was pouring down rain and we were headed back toward Shannon from Belfast. We were on the main highway and getting cranky because of the storm and from the bigger roads, there’s not a lot of super beautiful scenery or many interesting things to see . It was not the way we wanted to leave, so once we were in the west, we picked an exit at random and started exploring it. There were a few ruins here and there. There were a few historical signs pointing off in random directions and we found ourselves in the middle of nowhere on a country road hunting for castles. A tractor was coming at us from the other direction and as we pulled over to let him pass, we asked him if there were castles nearby. He told us about 3 or 4 of them and ended with “but you know it’s raining, right?” He shook his head when we said we didn’t care, muttering something about crazy girls. Then he began to give us directions to the one that wasn’t a hotel saying, “Well then, just go up the road a few miles, look for the dog at the top of the hill, pull into the driveway of the stone house, knock on the door, and ask for the key to the castle.” We thanked him and continued on down the lane. We found the dog, shivering and wet. We pulled into the drive, and knocked on the door of the stone house. When a very startled man answered and we asked for the key to the castle, he too responded with “You know it’s raining, right?” while he frantically looked for it. 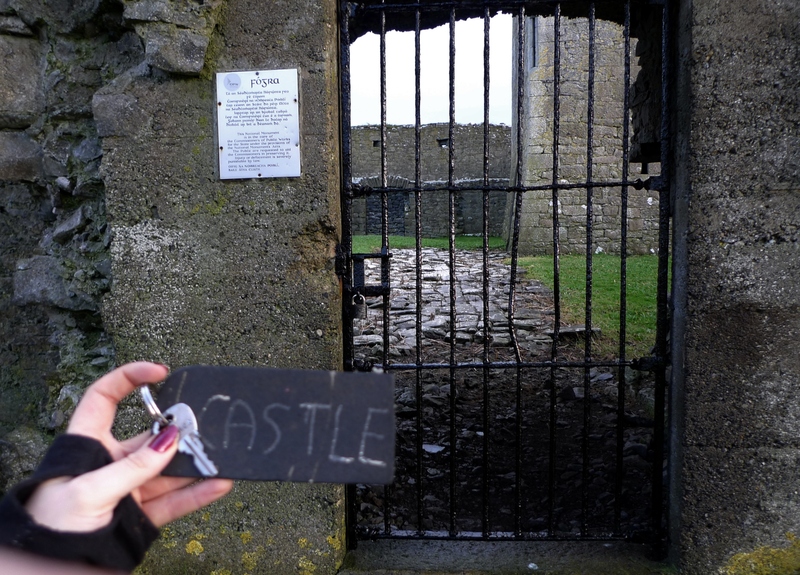 After a phone call or two and a reasonably thorough search, this is what he gave us – there’s no mistaking that it is the key to a castle, with that kind of key chain.